Historically, Magnum Opus, or The Great Work, was an alchemical process that incorporated a personal, spiritual and chemical method for creating the Philosopher’s Stone, a mysterious red colored substance that was capable of transmuting base matter into the noble metal of gold. Discovering the principals of the Philosopher’s Stone was one of the defining and at the same time seemingly unobtainable objectives of Western alchemy. The Great Work of the Metal Lover is an artwork that sits at the intersection of art, science and alchemy, re-examining the problem of transmutation through the use of modern microbiological practice and thus solving the ancient riddle. 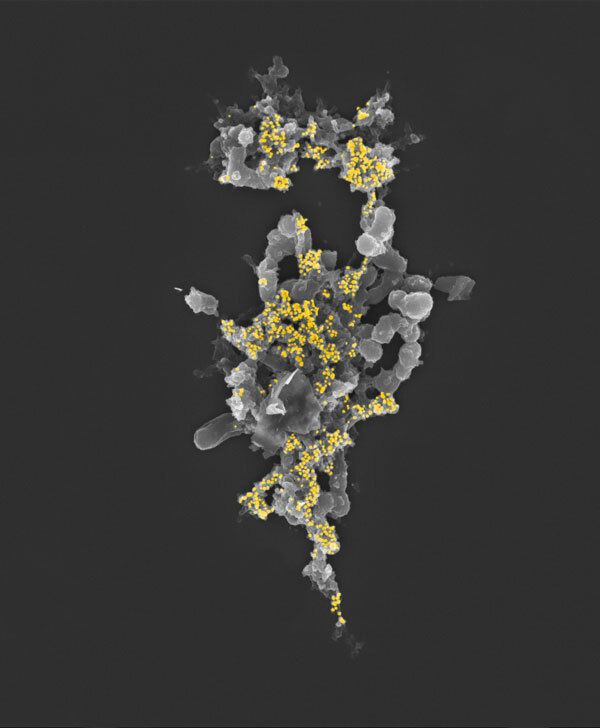 Gold production is accomplished by the pairing of a highly specialized metallotolerant extremophilic bacterium and an engineered atmosphere contained within a customized alchemical bioreactor. The extreme minimal ecosystem within the bioreactor forces the bacteria to metabolize high concentrations of toxic AuCl3 (gold chloride), turning soluble gold into usable 24K gold. Extremophiles are microorganisms that are able to survive and flourish in physically and/or chemically extreme conditions that would kill most of the life on our planet. It is believed that extremophiles hold the key to understanding how life may have originated due to their unique ability to metabolize toxic substances like uranium, arsenic and gold chloride. Interestingly, the earth’s lakes and oceans contain vast quantities of dissolved gold, perhaps as much as ten trillion dollars worth, though in dilute concentrations. Because of its form, it is virtually unusable. There is now compelling evidence suggesting that many of the earth’s gold deposits are formed not through heat, pressure and geochemical processes alone, but are indeed formed by microorganisms. The Great Work of the Metal Lover is an artwork that exists in two parts. 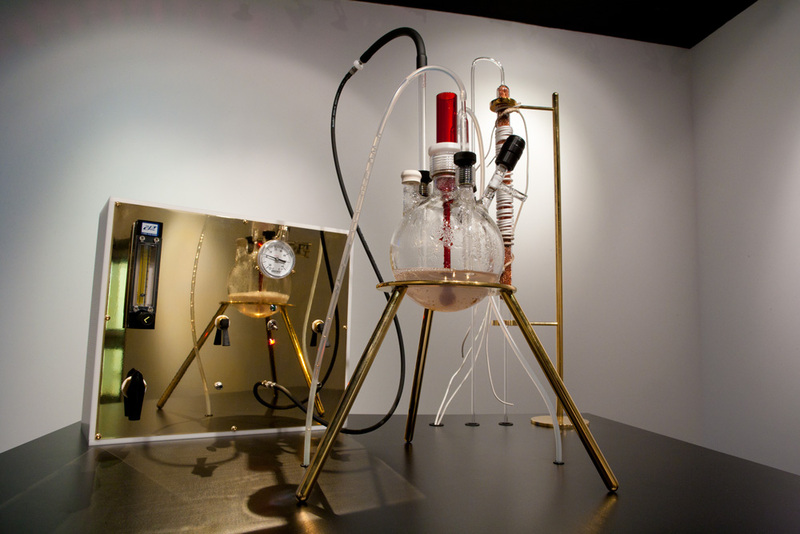 The first part is an installation consisting of custom laboratory equipment including a glass alchemical bioreactor, a gas manifold and a gas tank filled with carbon dioxide and hydrogen. The process is all documented in real time by a USB microscope and a real time video feed. The second part of the work consists of a series of images made with a scanning electron microscope. Digital prints are made using modern technology. 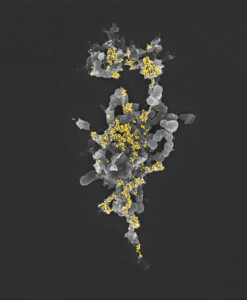 Gold deposits produced by the bacteria are identified within a polysaccharide matrix formed by cell aggregates or biofilms. Then, using ancient gold illumination techniques, 24K gold leaf is selectively applied to regions of the print where a bacterial gold deposit has been identified. 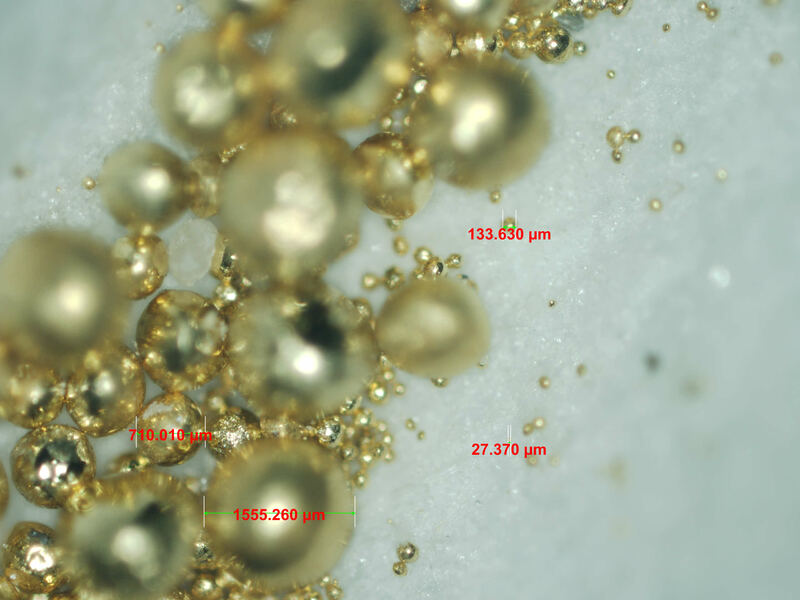 Each print contains some of the gold that was produced in the bioreactor. Gold has played a vital role throughout history, and has been recognized for its glorification of both humanity and the divine. It is treasured for its rarity, malleability and incorruptibility. 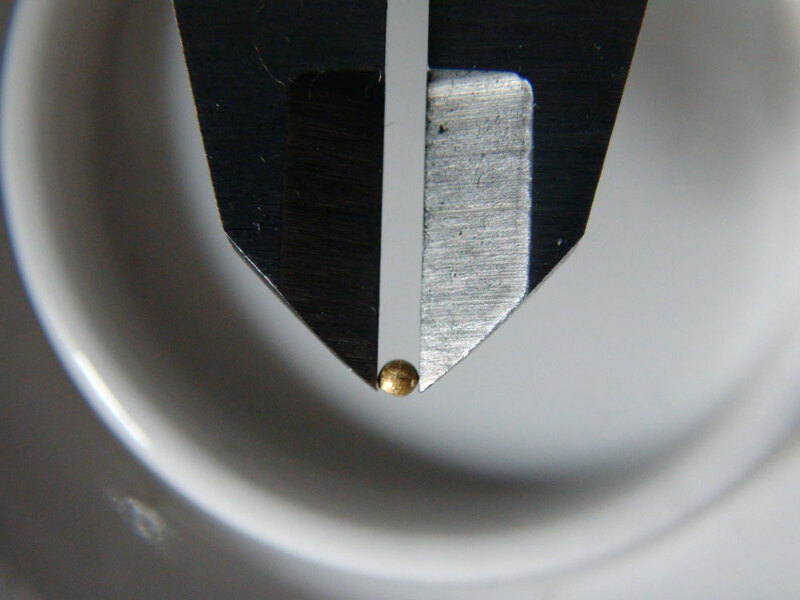 It resists oxidation, corrosion and other chemical bonding processes. Like alchemy, gold is imbued with secrets of the earth, origins of life and early metabolic processes. The Great Work of the Metal Lover speaks directly to the scientific preoccupation with trying to shape and bend biology to our will, essentially questioning the ethical and political ramifications of attempting to perfect nature. This project would not be possible without the support of the Humanities and Arts Research Program at Michigan State University and the Michigan State University Museum.